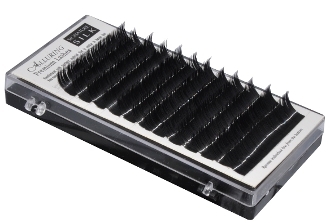 This Alluring Silk lash tray comes with over 4,000 lashes. These lashes are black, silky, glossy and curled to perfection. Alluring silk lashes are made from synthetic polyester. Synthetic lashes respond better to wear and tear than other materials. In addition, synthetics have the least possible chance of allergic reactions with human skin. With proper application, Alluring lashes look and feel completely real. Our lashes are designed to be indistinguishable in size and weight to human lashes.